Golden State Warriors shooting guard Klay Thompson scored 60 freakin’ points last night against the Indiana Pacers at Oracle Arena, and he did so in just 29 minutes over three quarters! 60 points, on 21-of-33 shooting from the field (8-14 on threes), and 10-of-11 at the line. Klay Thompson 40, Indiana Pacers 50. Halftime. Klay Thompson has the first 40-point first half in the NBA since Kobe Bryant had 42 points against the Wizards on March 28, 2003. Warriors' Klay Thompson joins Carmelo Anthony and LeBron James as the only three active players to score 60+ points in a game. 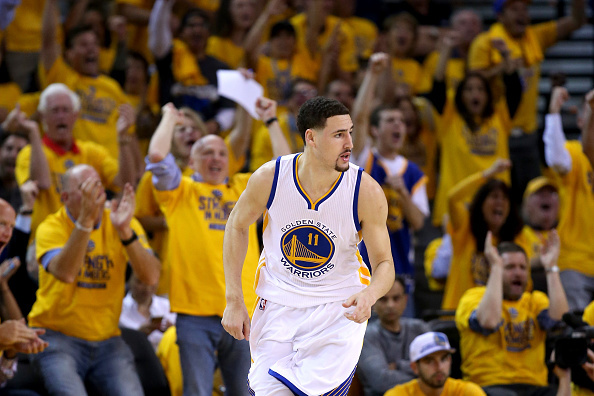 Klay Thompson has 60. In 29 minutes. Kobe, LeBron, Melo, Arenas, AI, T-Mac and Shaq are the others who have dropped 60 since 2000. Klay Thompson has scored more points tonight than Brian Scalabrine did in his final two seasons combined. And last but certainly not least, Thompson’s 2.07 points per minute almost matched the pace of Wilt Chamberlain’s 100-point performance from 1962!